Starfruit is a juicy tropical fruit grown in Thailand and throughout Southeast Asia, Australia, South America, but also in Hawaii and Florida, so they're easy to find at your local grocery store or market. Starfruit is a good choice during the winter months when they're readily available. And because they're a good source of Vitamin C, star fruit can help ward off winter colds and flu. With only 30 calories per fruit plus lots of fiber, star fruit is a great choice for anyone trying to lose weight. They're also very healthy—full of antioxidants and flavonoids. When ripe, star fruit appears mainly bright yellow with tinges of light green. They may have some dark brown along the five ridges—this is normal. The flesh should still be quite firm to the touch. You can also buy star fruit when it's green and wait for it to ripen—just leave it on your counter for a few days. When over-ripe, star fruit turns entirely yellow and starts to have brown spots all over. 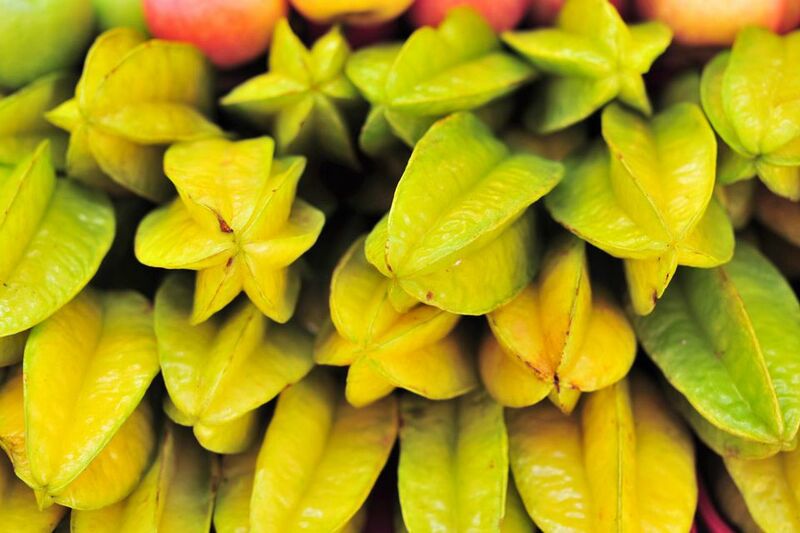 Nice to eat fresh, but also delicious cooked or juiced, star fruit is truly one of nature's starry-eyed wonders! Rinse the star fruit, or lightly wash it with a homemade fruit and vegetable wash. 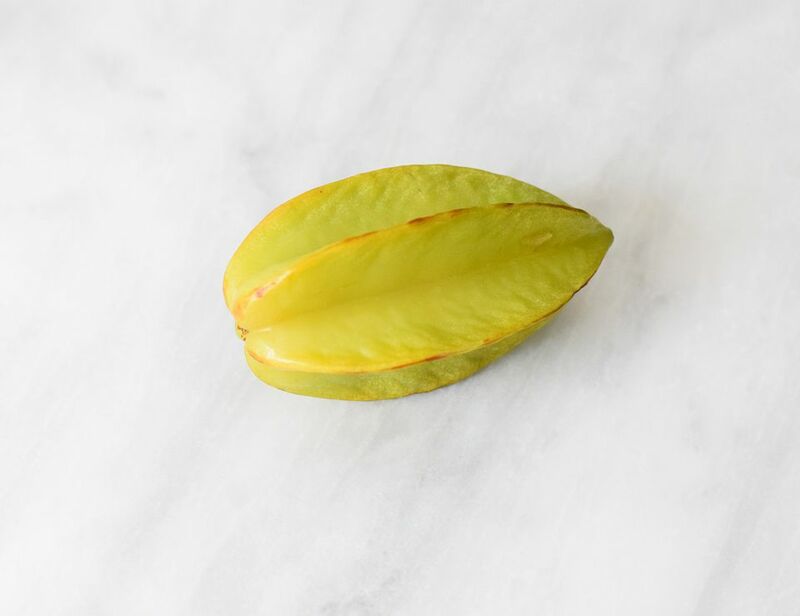 Hold the star fruit vertically over a cutting board or counter-top. Using a sharp knife, cut very shallowly down along each of the five ridges (or "star points"), removing and discarding the brown outer edge. Turn the star fruit on its side. You will see that one end of the fruit comes to a peak, while the other end is flatter with a dark spot (where the stem was attached). Cut off this end piece and discard. Now your star fruit is ready to be sliced. Like an apple, you can cut thin or thick slices—it's up to you. Either way, you'll love the beauty of cutting this marvelous work of nature. Note: If you are cooking with the star fruit, check your recipe for instructions on how thick you should slice it. Using the tip of your knife, remove and discard any seeds you find (Starfruit seeds are similar to apple seeds, but can be slightly larger and flatter). Your star fruit is now ready to be eaten fresh or added to fruit salads or desserts. Starfruit is also excellent juiced and is especially delicious combined with pear juice. It also makes a beautiful garnish for dishes as well as for cocktails. Just make a slit in the side of a small star fruit slice and slide it onto the side of your glass.